When I heard about Ford’s new-to-the-U.S. three-cylinder EcoBoost engine available on the subcompact Fiesta, I was intrigued. The tiny, 1.0-liter turbocharged motor is lightweight yet relatively powerful, and Europeans – both auto experts and everyday drivers – have raved about it for years. But beyond this interesting engine, my expectations for the 2014 Ford Fiesta SFE were modest. This is a small and affordable car, and my plan for testing it was rigorous: a road trip from Atlanta to Gainesville, Florida, on to St. Augustine Beach and, finally, back to Atlanta. 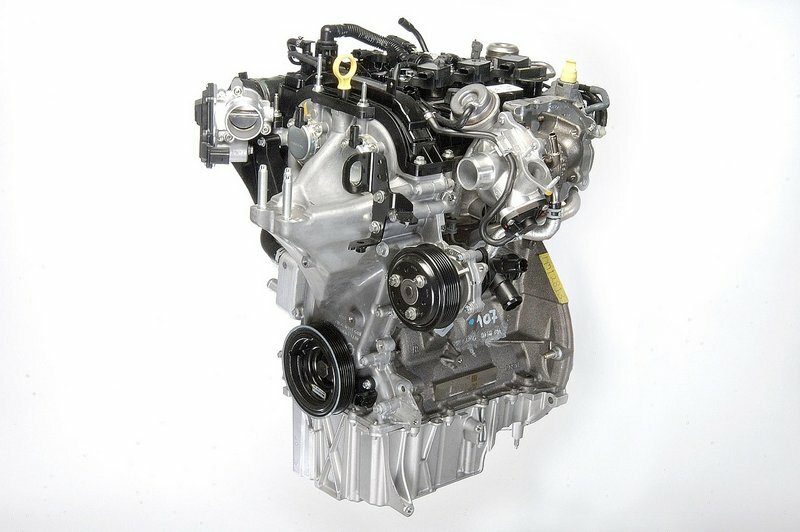 The compact, 1.0-liter EcoBoost is a turbocharged three-cylinder engine. In the 2014 Fiesta, it’s mated exclusively to a 5-speed manual transmission. Aside from limited passenger and cargo space, some around-town driving before the trip alleviated some of my concerns. The ride quality is impressive considering the vehicle’s light weight and short wheelbase. Plus, the rev-happy EcoBoost engine is a delight, with enough power and torque to move the little machine with surprisingly little noise or harshness. Practicality was the real question. With our two five-year-olds already visiting grandparents in Florida, the Fiesta had to carry only my wife and me along the first leg of our journey. But once the kids were in the back seat, we still had hundreds of miles to go. We packed light to leave room for the kids and their gear and hoped we weren’t making a big mistake. 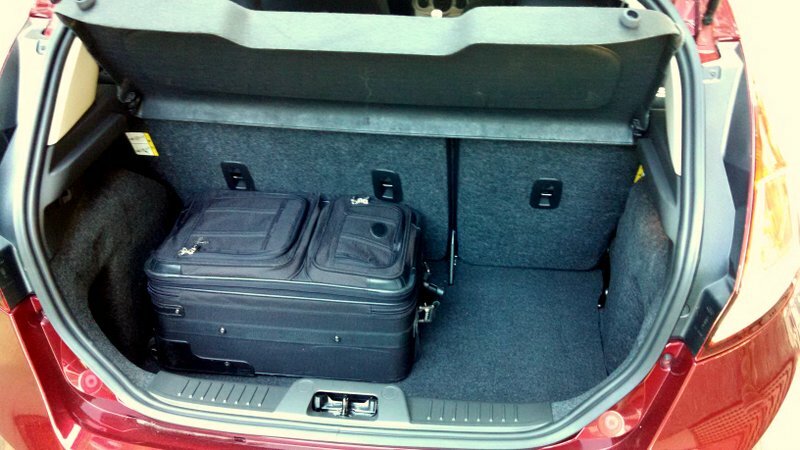 The cargo space is fine for two travelers and, with the rear seats folded, positively spacious. But is it suitable for a traveling family of four? The first 350 miles were a breeze. With the cruise control set just a touch over the speed limit, the fuel-sipping three-cylinder engine pulled the Fiesta gracefully down Interstate 75. We talked, listened to music or just enjoyed some quiet time as we rode south. Traveling without kids is a treat for parents. We always stop in Tifton, Georgia – about halfway between Atlanta and Gainesville, Florida – to refuel our brains. The Fiesta, on the other hand, can go much farther before refueling. Despite its small, 12.4-gallon fuel tank, the Fiesta could have easily completed this segment of the trip without refueling. Saving a few bucks by stopping for fuel north of the Florida border is practically a tradition for us, though. Upon arrival at my in-laws home, the Fiesta’s trip computer showed average fuel economy of 44 mpg, just 1 mpg shy of its EPA highway rating. North Central Florida is hardly a big-name destination, but it does include some natural features that make it a great place to visit, especially on hot and humid summer days. The Fiesta carried us to a day of play in the cool, clean water of the spring-fed Rainbow River near Dunnellon, Florida. We floated lazily in rented tubes, enjoying 360 degrees of natural beauty: crystal-clear water, aquatic plants and the sandy river bottom below; giant old cypress trees dripping with Spanish moss all around; a cloudless Florida sky above. We then packed up our gear and headed toward the Atlantic coast. Squeezing in our family’s luggage, supplies and beach bag was not issue, in part because I intentionally left the package tray (cover) for the Fiesta’s cargo bay back home. This allowed me to stand the suitcases up, reducing their footprints. Still, our gear did not intrude on rearward visibility. Everything fit below the beltline. We opted for rural route to the beach consisting mostly of two-lane county roads, lined with farms and punctuated by the occasional small town. Stop signs and turns slowed our journey but gave me an opportunity to run through the Fiesta’s five-speed manual gearbox. Even with modest output from the EcoBoost three-cylinder – 123 horsepower and up to 148 lb-ft of torque – the Fiesta is truly fun to drive. It won’t win too many drag races, but it never feels anemic, either. Even at high engine speeds, the EcoBoost remains poised. Gearing is tall, so drivers likely won’t pine for a sixth ratio. Following a day of sand, sun and surf just south of America’s oldest city, we started on the 400-mile trip back to Atlanta. Just as the Fiesta carried us comfortably to Florida, the trip home was equally trouble-free. About an hour from home, we noticed a surprising absence of backside discomfort. How could so many pricier vehicles come equipped with sub-par front seats while the affordable Fiesta delivers the comfort and support necessary for long-haul driving? Average fuel economy reached 45 mpg on the trip south, then slowly dipped as the trip continued. Here it is at 43.7 mpg as we climbed toward Atlanta. 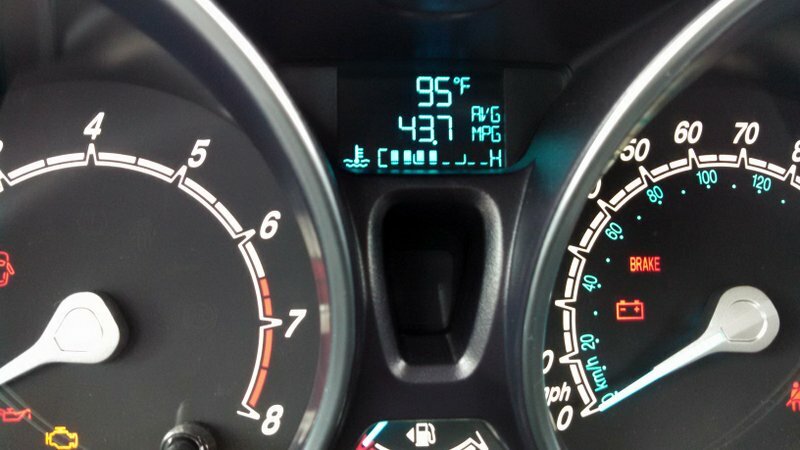 Final average fuel economy was 43 mpg. 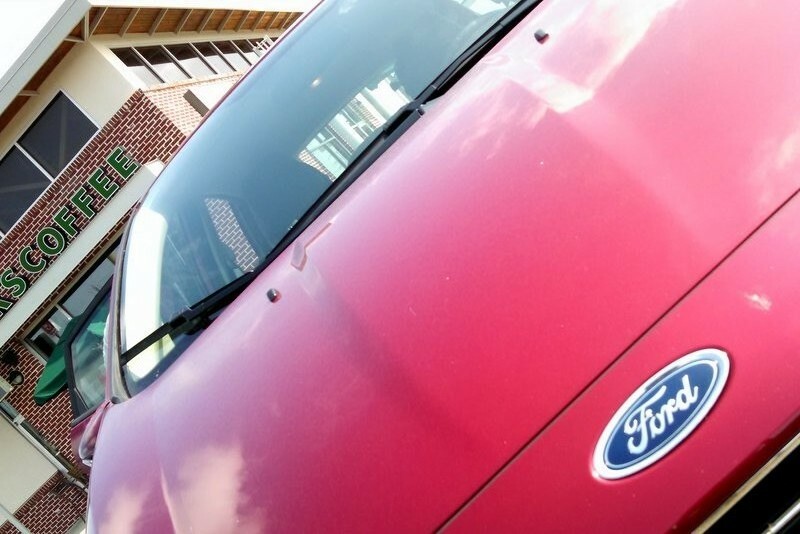 After logging nearly a thousand mostly-highway miles, the Fiesta’s computer showed average fuel economy of 43 mpg. That may not quite be hybrid or diesel territory for a car this size, but it’s certainly close and better than I expected. The whole package, in fact, is better than I expected. Sure, it has its drawbacks, most notably no automatic transmission available with the EcoBoost motor and interior finishes that don’t exceed the Fiesta’s economy-car status. Its crashworthiness is questionable, too. 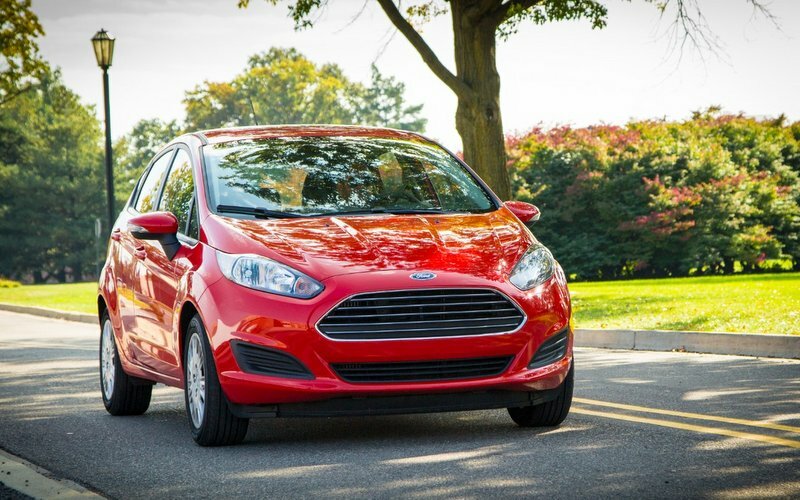 The Fiesta earned a miserable, 2-star rating in one portion of NHTSA testing and a 4-star overall score. Its performance in the new, small-overlap frontal crash test by IIHS was weak, too. Compared to the competition, the outlook is rosier: IIHS tested a dozen subcompacts in its new test, and only two scored higher than the Fiesta. In terms of overall value, the 2014 Ford Fiesta SFE is a real pleaser, one of the few cars I’ve driven this year that delivered beyond my expectations. Drivers looking for an affordable and fuel-efficient vehicle that doesn’t sacrifice on comfort or driving enjoyment should find out what some European drivers have known for years: the little, EcoBoost-powered Fiesta is a big star in Ford’s model lineup.